"As a Coach and Facilitator, I purchased The Power of Effective Communication teleclass product from Ready2Go Marketing. The support I received from Kim Clausen, President of Ready2Go Marketing was exceptional. She listened and gave me solutions to facilitating problems I had encountered in the past, was eager to assist and has a wonderful follow-up system that is hard to find. She truly cares about the facilitator's success. The material was very well put together, and was easy to follow and understand, removing the apprehension one usually feels when giving a seminar or teleclass. The material was informative and had a great deal of activities, allowing for constant participation from those attending (very interactive). I found that providing this to a small group is a great way for participants to get the most benefit for it allows people to express themselves and their concerns and have them be addressed by me, as the facilitator and the group itself. I truly recommend working with Ready2Go Marketing Solutions." Our audio training programs are created by professional copywriters and designed so you can easily create your own audios to send to your clients and prospects. Each audio training program is a 4-6 minute script already written out, that you record in your own voice. We provide you with the scripts and instructions for recording, uploading and sending. We also give you the emails for delivering each audio. We've made it easy. You just customize and brand, give it your personal touch, record, load and send. And it's an easy process to do. And if you get hung up and need assistance, we can help you! To take a look inside, go to the audio training programs page and download your free preview. With our full product suite you have thousands of dollars of already thought out and formatted content. You can use the content as is or repurpose it for many other uses. The bottom line is that you have hours and hours and pages and pages of content, with many suggestions on how you can effectively implement it into YOUR OWN BUSINESS MODEL. The Self-Study Coaching Programs has been conveniently designed for you to deliver as a product that your clients can work on independently. You can offer additional follow up, interaction and coaching, or deliver the Self Study Programs as a stand alone product. Each Program has 4-8 modules with an abundance of engagement and variety. There are activity sheets, debrief questions, audio segments and even guided visualizations - all done for you. The content is the same as the teleseminars, and has been reformatted to be delivered via email, website, audio and workbook, or put on a coaching platform like Jigsawbox or Coaches Console. This product is easy to set up and will make a very profitable addition to your business. To take a look inside, go to the self-study coaching programs page and learn more. Once again, our special reports are written by professionals in the industry, so you can trust that you are getting high quality products. Each special report is 5-10 pages long. All you do is customize it, give it your individual touch, brand it with your logo and contact information, and viola! You now have a compelling special report to use to drive people to your web site to opt-in, or to send as a free offer to your clients and prospects at anytime. This is a powerful strategy for growing your list, or a great offer to give at a speaking engagement or on your next telecall. We also provide 10 tips on how to use the special report to grow your business in the Special Reports Package. To take a look inside, go to the special reports page and learn more. As with our other products, our speeches are written by professional, certified speech writers. You get professional grade quality in your 30 minute scripted speech, that you can then take and add your own voice to make it your own. To make your practice, memorization, and delivery a lot easier, you also get a speech overview and outline. Included in this package is a very extensive speaking guide, giving you many suggestions on presenting and marketing your speech, for a professional delivery. To take a look inside, go to the speeches page and download your free preview. Our success tips are written by professional copywriters. They contain twelve individual 100-200 word "mini" articles that are ideal to send as weekly success tips. They can also be used as blog posts or short articles in your newsletter. To take a look inside, go to the success tips page and learn more. Starter Packs are designed to help you get started fast with a compelling special offer and numerous other ways to communicate to gain exposure and grow your list. In addition to the special report (which is an ideal free offer), you also get two articles, success tips and tweets - all designed to help you go into your market with great value so you can get know and grow your list fast. Instructions for implementation are included. To take a look inside, go to the starter packs page and download your free preview. Our teleseminars are developed under the same premise as the workshops - very learner centered. Therefore these teleseminars involve a lot of participant interaction and engagement. Unlike most teleseminars we've been on, attendance should be kept to a minimum (up to 20), so you can keep the lines open and allow people to interact and learn. This is NOT a one sided lecture call, it is highly interactive, and very learner centered like the workshops. As with the workshops, the teleseminars are easy for the facilitator to use and follow as EVERYTHING is spelled out clearly in the teleseminar itself, and in the extensive facilitator instructions provided. The facilitator guidelines instruct you on how to create a space for the learner to learn, and to get out of the way and let the learning unfold. The teleseminars also have 15 pages of action items and guidance on how to market, plus timelines, check lists, email invitations, fliers, forms, and a lot more. To take a look inside, go to the teleseminars page and download your free preview. Our tweets package includes 60 professionally written tweets so you can be active on Twitter - gaining exposure, making new connections and promoting your products and events. To take a look inside, go to the tweets page and learn more. Our workshops are created with a very specific philosophy - make it LEARNER CENTERED. It's not about the facilitator teaching, it's about the participant being given the tools and the environment to learn and create for themselves. Therefore, you will notice that our workshops are designed with a very specific structure — light on lecture, heavy on participant engagement and involvement. Each workshop is exercise/activity laden and designed with a brief set up by the facilitator, an activity/exercise that is conducted by the participants in combinations of diads, triads, groups or alone, and then an extensive debrief. It is in the debrief where most of the learning happens and is locked in. These activities can be physical movement, writing, doing kinesthetic activities, or talking. The workshops are easy for the facilitator to use and follow, as EVERYTHING is spelled out clearly in the workshop itself, and also in the extensive facilitator instructions provided. The facilitator guidelines instruct you on how to create a space for the learner to learn, and then get out of the way and let the learning unfold. The workshops also have more than 25 pages of action items and guidance on how to market, plus timelines, check lists, email invitations, fliers, forms, and a lot more. 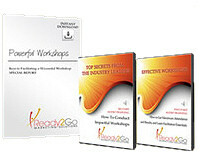 To take a look inside, go to the workshops page and download your free preview. Take a look, enjoy the ease of delivering value added content to your prospects and clients. And remember, your satisfaction is ALWAYS guaranteed. If our products do not meet your needs, you can return them for a full refund. Best wishes to you, and here's to your success.